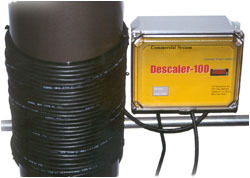 DCS-100 is our Electronic Descaler. This innovative product is a compact system to solve hard water problems without the need of chemicals, water softeners and constant maintenance. modulating frequency wave form. This produces an inaudible sonic impulse that changes the electrical and physical properties of calcium carbonate crystals and other minerals to repel rather than adhere to pipes. Simply connect the flexible shaft to the machine, attach the cleaning brush, connect water hose to machine and plug the power cord in. Press the foot pedal to turn the machine on (brush will spin) and feed the flexible shaft in the tube sheet. Dimensions: 8 1/2" x 6 1/2" x 6"
Pipe Size: Up to 8"
What makes the Electronic Descaler better?